Alan Kay August 26, 2011 January 9, 2015 1 Comment on What to do when you facilitate change, strategy or a meeting! 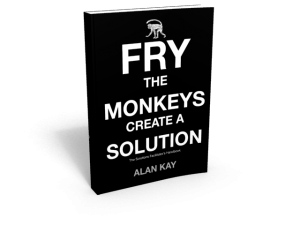 When I wrote the book ‘Fry a Monkey. Create a Solution’ I had only one idea in mind – that it be useful to people who facilitate (today, that’s most of us). I had no desire to write a bestseller. I’m totally confident that you will get value from the book. Still, click on the monkey below to hear more reasons to get this easy-to-use handbook for speeding up change and progress and reaching better outcomes.